One of my favorite clothing websites is ModCloth, and what I love the most (besides the feminine vintage dresses) are the names they give the clothes. Lakeshore Picnic Dress. Last Slow Dance Dress. Flirting with the Idea Dress. Bakeshop Browsing Dress. Under a Blue Sky Dress. The names are as lovely as the dresses themselves, and I could read through them all day. 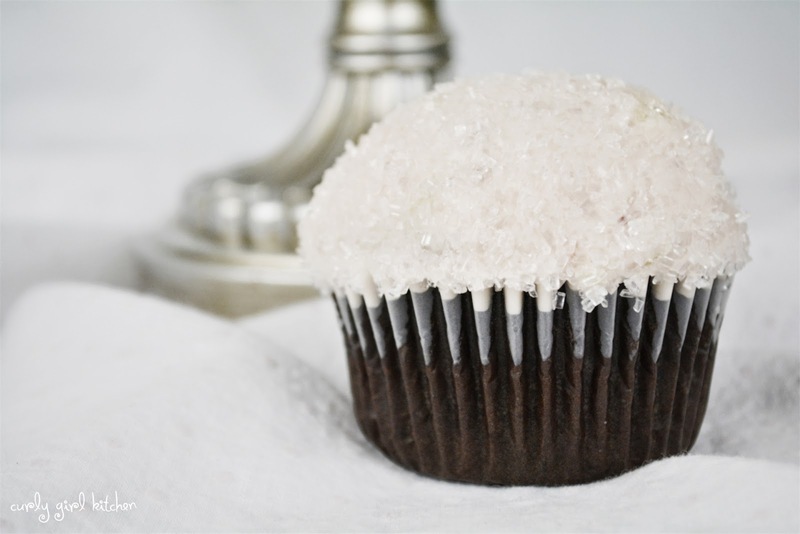 Last night, I consulted with Jamie on a list of names for these cupcakes, including Glitter and Glam Cupcakes (which was his favorite, because, according to him, it sounded naughty) and An Evening out Cupcakes. But in the end, I decided these were Pretty in Sparkles Cupcakes. It's not often that I make cupcakes instead of a layer cake, but every so often I have an urge to whip up a batch of pretty little cupcakes. It's also a good way to use up all the leftover bits of buttercream I save in the freezer. The best part about decorating these is that you don't need any special piping tools, just the frosting, a knife or small spatula and sparkling sugar. 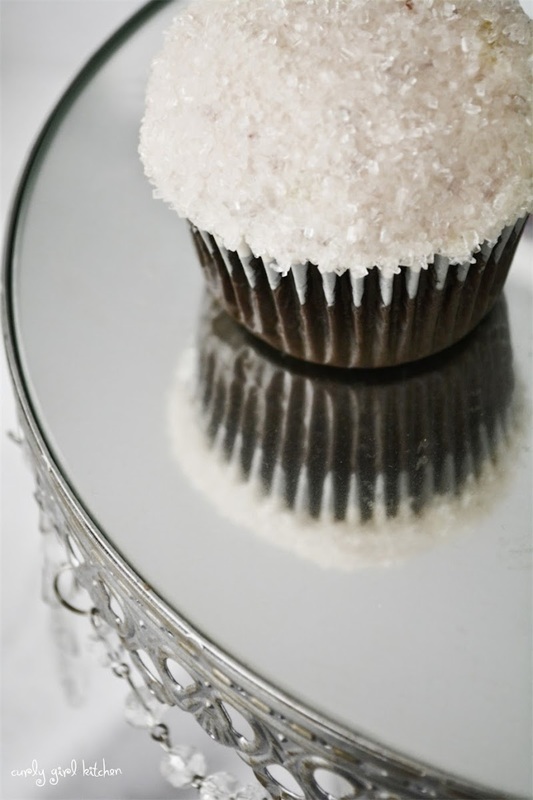 After frosting these in pale pink buttercream, I dipped them in a bowl of white sparkling sugar, completely covering the frosting. I thought they looked so beautiful, like little pieces of jewelry. I tried a few other colors of sparkles (not pictured here), because I ran out of white, but I really liked the look of the white the best. 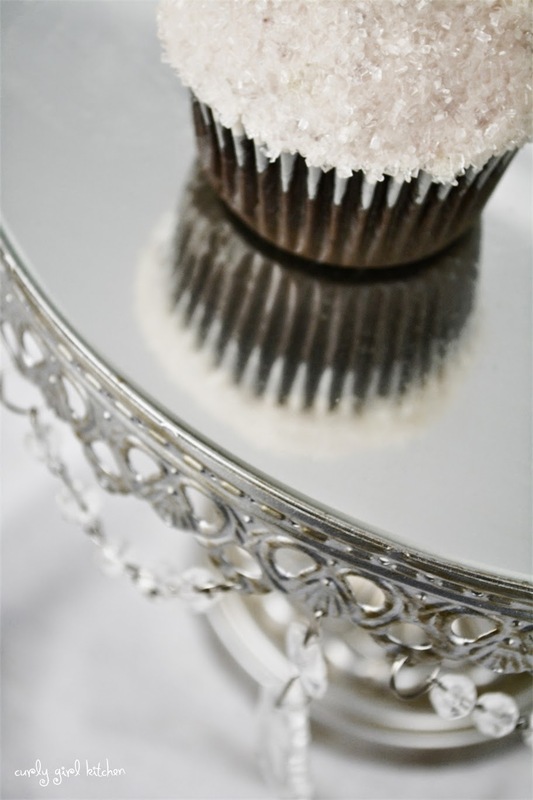 Any color of frosting can be used, and when dipped in the white sparkling sugar, the color will peek through ever so shyly. Baker's Note: Be sure to use coarse decorating sugar, not baking/granulated sugar which can melt from the moisture of the frosting.